IDW has moved its branded iOS apps from ComiXology to Madefire, relaunching with an IDW app for the entire digital library (over 3500 comics and graphic novels, they say), plus specific apps for Transformers, Star Trek, and Teenage Mutant Ninja Turtles comics. The big difference? Their new apps allow in-app purchases, unlike ComiXology’s, which require a trip to a separate website so Apple doesn’t get a cut of the purchase. Forcing that action is customer-unfriendly and likely removes a lot of impulse purchases. They plan to launch Android and Windows 8 apps soon with “TV screens and console game devices” promised for later this year. If you’ve bought comics from IDW in previous apps, you’re able to sync your comics following their instructions. 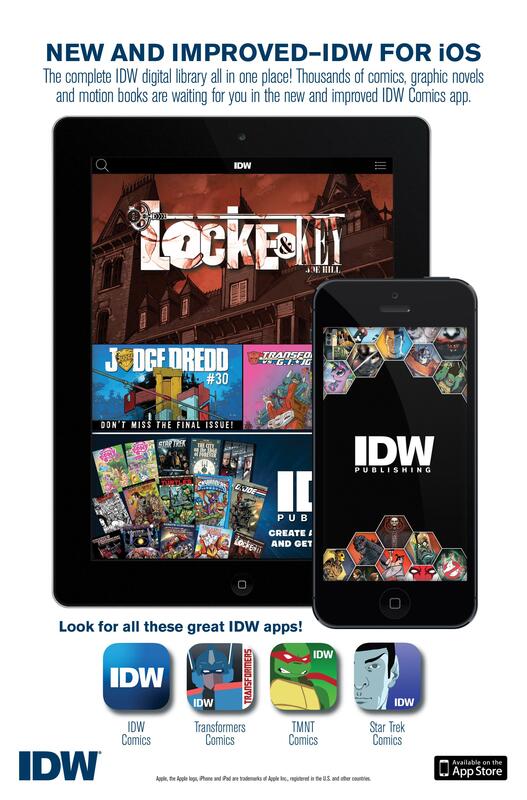 ComiXology has also published an article about how to keep access to your IDW comics in their app. IDW wants customers to access their comics in a variety of formats and stores, a strategy shared by other publishers. Along similar lines, while a lot of Top Shelf (now part of IDW) graphic novels are available in the Sequential app, they aren’t yet available in this IDW app, which so far focuses on mostly licensed publications. That’s a welcome feature; even though IDW has gone mostly DRM-free (Nickelodeon won’t let them take the DRM off TMNT, but Hasbro has, surprisingly, allowed them to remove it from Transformers, MLP, and GI Joe; not sure about Star Trek and the other licensed books) there’s still something to be said for having your purchases tracked server-side so you don’t have to keep a local copy of everything. 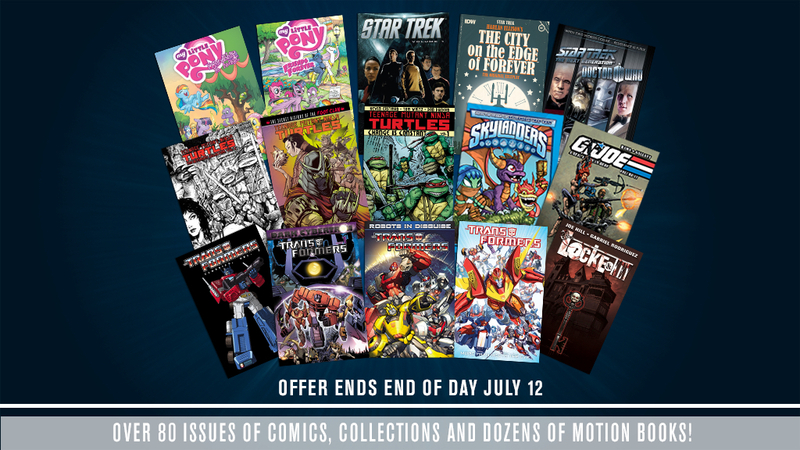 The Humble IDW / Top Shelf Bundle is still going for 3 more days, too, and I’ve really been enjoying it, especially Parker and March. Since this bundle had a lot of books I’d been wanting to read, and since I had a gift card lying around with only 89 cents left on it, I spent that 89 cents on it so I could see if IDW had gotten its act together. It has; these books look great, and after I’d read the first volume each of March and Parker I added to my donation so I could get the top-tier level of books. All of which is rather a long tangent that doesn’t have much to do with IDW’s new Madefire-based apps. At a glance, it looks like you won’t be able to sync your Humble Bundle purchases, either, just your Comixology ones; that’s too bad (especially since I’d love to be able to get higher-quality versions of those Transformers books) but it’s understandable. Seems kind of odd that they’re using a TMNT image from the 2003 cartoon series instead of either the current cartoon series or any of the currently-in-print comics, too. I seem to recall a rumor that Apple is considering changing the cut for certain publishers for just that reason. But I haven’t seen any good figures on how much purchasing has dropped due to the added friction of going elsewhere to purchase. So it’s hard to determine how much of an affect it’s had. Adding: I submitted an E-Mail asking if there are plans to allow Humble Bundle purchasers to access their comics in the IDW apps in the future; I got a one-line response saying that there are but not giving any other information. So at least they’re looking into it; no word on how or when though.